Cynthia Bach’s life story is like a fairy tale. No make that a movie script. 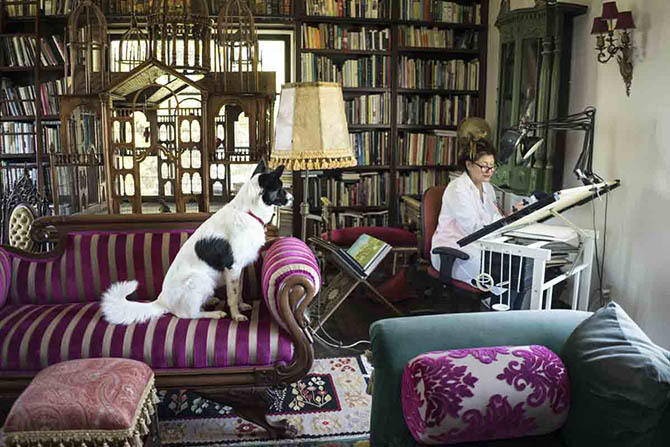 It begins a long way from the glamour of Los Angeles, California where she lives and works today, designing some of the most spectacular platinum jewelry found anywhere. As she grew up her ambition became more focused. Cynthia took intensive art classes at her German high school. When her father was stationed back in the United States at the Dyess Air Force Base in Abilene, Texas, Cynthia enrolled at McMurry University to remain close to her family. There wasn’t a jewelry course in the art department but that obstacle did not stop Cynthia. She convinced other students and one of the art instructor’s Bob Howell they needed one. It wasn’t long before they were working with elaborate equipment, cutting stones with lapidary tools and making designs. Once Cynthia felt steady in her skills, she asked a local Abilene jeweler, Jim Matthews, for an apprenticeship and she found a soul mate. The two bonded over beautiful craftsmanship and historical designs, fell in love and were married shortly after Cynthia’s 1982 graduation. With the combination of Jim’s supreme skills on the jewelry bench and Cynthia’s elegant designs, word of their talent spread way past the borders of the Lone Star State to Los Angeles where the couple relocated in 1989 to work in the Beverly Hills office of an esteemed French jewelry firm. But working for someone else was not their destiny. Once Cynthia completes her designs, Jim gets busy carving a wax and covering every earring, necklace, bracelet and ring in gorgeous details. The best of the brightest pieces are always made in platinum. “Platinum is a really sweet material,” explains Jim in his delightful Texan drawl. “It is soft to cut and wears hard. It doesn’t corrode; it just patinas. 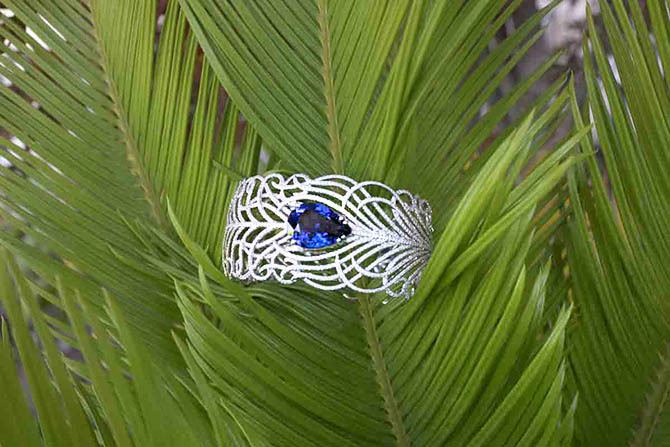 In other words, it resists abrasion and develops a lovely luster as it ages.” Engraving, filigree and milligraining are just a few of the master techniques Jim implements on Cynthia’s designs. “If there is a smooth place I am going to make it textured somehow,” Jim explains. 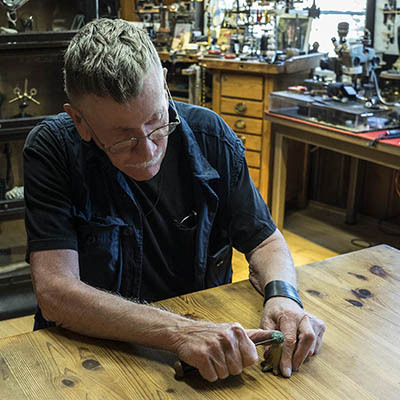 I sat down with the creative couple at their grand home in Los Angeles, where they live and work, to talk about some of their sensational platinum jewels. The platinum and diamond Crown rings formed your first collection and are still among your most beloved designs. Beyond the beautiful regalia, what inspired you to make them? Cynthia: It started when we were in Texas. A man came into our store with his wife’s costume Trifari crown brooch and said, ‘Now I can afford it in rubies, emeralds and sapphires and I want to give that to her.’ We did a design adaptation and she wore it on a chain as a necklace. From that moment on, I got hooked on and obsessed with crowns. For me, they were a symbol of love. They are also history and representation of the highest order of the jeweler’s art. We play with those ideas. In the designs there are all kinds of special platinum flourishes. Tell me about them. Jim: The base of the Coronet Crown Ring (in the photo on the left) was originally channel set diamonds. Then we thought it would be more interesting to set the stones in platinum florets. They had to be raised so the culet of the round stone could be off the finger and covered. 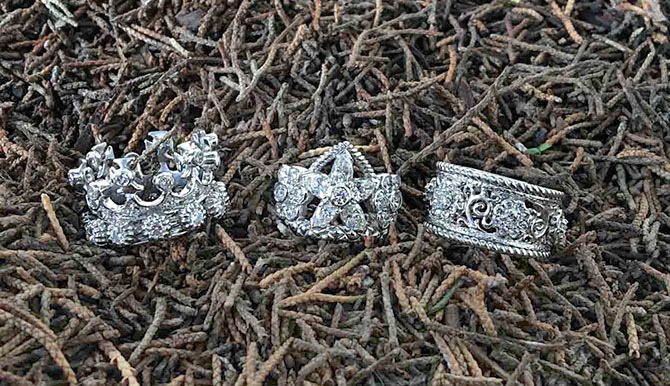 The Flower Crown Ring (in the center of the photo) has a platinum rope twist on the top that curves to left on the left side and the right on the right side. The platinum quilt pattern on the base was inspired by the quilt pattern I saw inside a casket. I spent months working on different quilt patterns in metal to get the light and shadow balanced. The Band Ring (on the right in the photo) has a gadrooned effect with sunflowers and diamond centers. 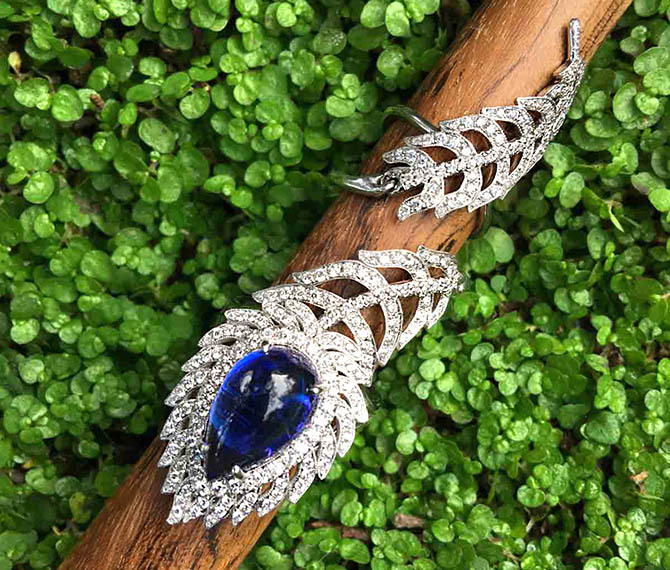 There are a lot of feathers in jewelry today, but your Peacock Feather platinum, diamond and tanzanite collection is so special. Cynthia: There is nothing more majestic than a peacock. I wanted there to be a lyrical quality to the feathers as I drew them. It has a flow and sense of movement that cannot be captured with a computer design. The work really expresses what our studio is about. For the gems, I like the clean look of the diamonds in platinum and the one 20.79-carat Tanzanite to capture the periwinkle eye in the feathers. It is fancy and fabulous. Jim: There are no sharp edges on the bracelet. The feathers are really animated. It took a couple of months to make. At the start of the twentieth century, when jewelers finally had the tools to work platinum, they went crazy showing off several different techniques on one piece of jewelry. It’s rare to see that type of effort and virtuosity today. But you do it on jewels all the time. On this locket, there are any number of flourishes on the platinum. Jim: That piece really does show a lot of different techniques. I made a sampler one time of all the variety of platinum techniques we use on jewelry. This piece shows a lot of them. There are ropes and a knotted look like woven threads. Some parts look braided. I don’t have names for all the different styles in the piece but there is a lot on the front, sides, inside and the back. Cynthia: We have worked together for 35-years so there is a symbiotic symphony between us where we can feed off each and we get each other excited about things. 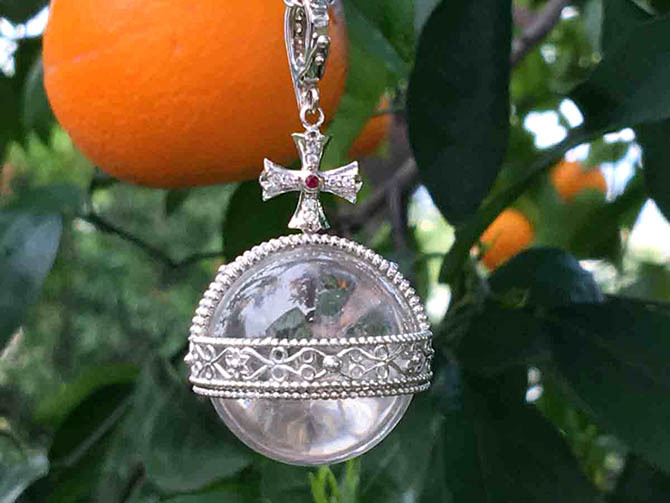 It comes out in all the elements of the jewelry. I do love the way you two have long conversations about jewelry and develop themes over extended periods of time. 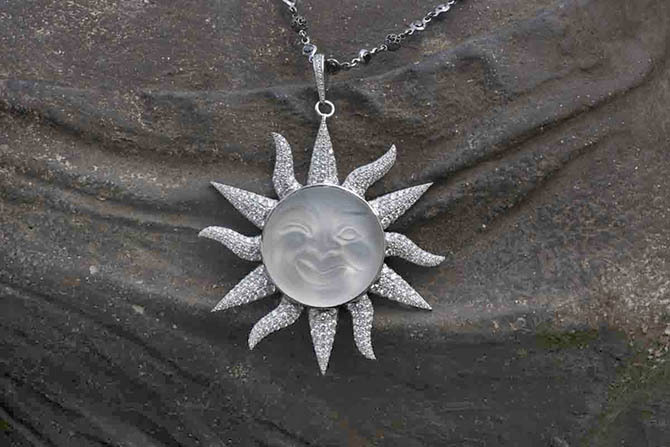 The Sun-Moon Pendant is a perfect example of that. Tell me the story. Jim: I made a carving of the moon in dense hardwood inspired by the nursery rhymes and poetry way back shortly after we left the French jeweler in Beverly Hills and I was looking for something to do with my hands. The design was based on depictions of the moon over a hundred years ago, when people were looking at it with telescopes and they saw a face in the shadows of the moon. Cynthia: Years after Jim made the wood carving I had a master gem carver in Idar-Oberstein, Germany named Uli Pauly transform the design into rock crystal. 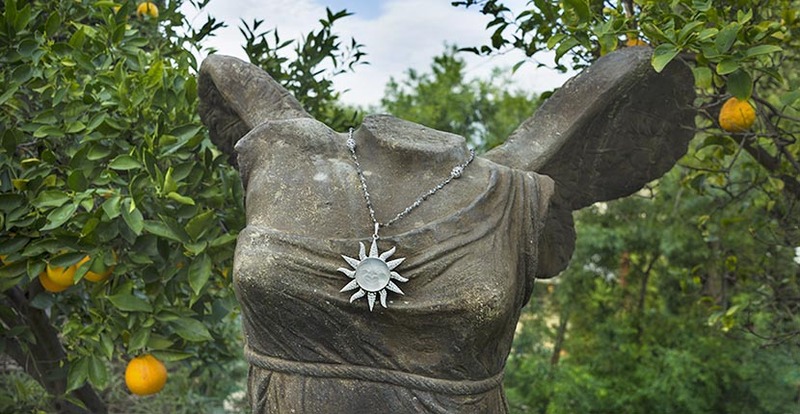 Once he was done, I set it in a sun of diamonds and platinum that reminded me of Louis XIV sun motif. Some things we do are historic concepts that take time to produce.